With the ability to monitor business data in real time through Ad hoc reporting tools, organizations can improve decision making, responsiveness and work processes. Ironically, getting interactive reporting tools into users’ workflows can be its own logistical challenge effort. 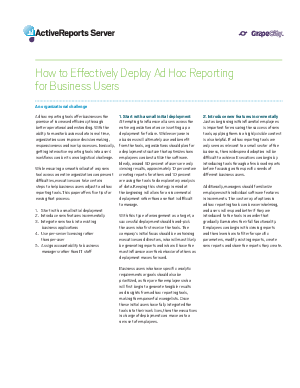 This white paper offers five tips for easing that process and discusses in detail how to effectively deploy ad hoc reporting for business users. Start with a small initial deployment. Integrate new tools into existing business applications. Read the white paper to learn more tips and to get more insight into each point.